The concept of eugenics is embraced by an identifiable movement in the medical and scientific fields that sees eugenics as a way to eliminate devastating diseases or inheritable mental or physical conditions. 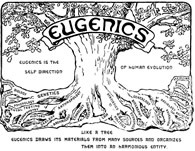 Eugenics – the scientific notion of selective breeding in humans - is commonly perceived as a negative concept thanks to its association with the Nazi regime and the pursuit of a superior race and the methods that were employed to meet that objective. The application of eugenics in the case of the Nazi regime included not only ethnic cleansing through the annihilation of millions of Jews but also a program to euthanize mentally and physically disabled infants, children and adults in the German population. The concept of eugenics is embraced by an identifiable movement in the medical and scientific fields that sees eugenics as a way to eliminate devastating diseases or inheritable mental or physical conditions. The concept of eugenics is most frequently applied to the prospect of preventing racial genetic mixing, serious advocates of eugenics suggest that it does not have to have any application to race in order to demonstrate improvements in humans. In fact, some experts argue that children from racially mixed marriages are actually somewhat healthier than non-racially mixed children and therefore eugenics would be irrelevant to improving humans in this regard. Advocates of eugenics argue that its application could have numerous benefits including but not confined to, higher intelligence and greater longevity. For most people however, the concept of achieving these benefits through methods that control who can marry whom and other restrictions on reproduction is disturbing even without a racial element. Human Being - Human Being research papers look into the many areas of study that address the notion of what a human being is. Race - Race research papers examine the sociological aspects of race and ethnicity in America. Intelligence - Intelligence research papers discuss the theory of intelligence. Human Reproduction ... Human Reproduction term papers examine the reproductive process from conception to birth. Eugenics in America - Eugenics in America research papers discuss the various eugenics movements in 20th Century United States. Human Mind - Order a research paper on the human mind from Paper Masters. Paper Masters writes custom research papers on Eugenics and discuss the concept of eugenics embraced by an identifiable movement in the medical and scientific fields that sees eugenics as a way to eliminate devastating diseases or inheritable mental or physical conditions.